Recognizing the importance of experiential learning, Bowling Green State University (BGSU) launched the Falcon Internship Guarantee program four years ago to encourage student exploration of career options early in their academic careers. Jackson’s goal is to provide students with as many opportunities to explore career options as possible. 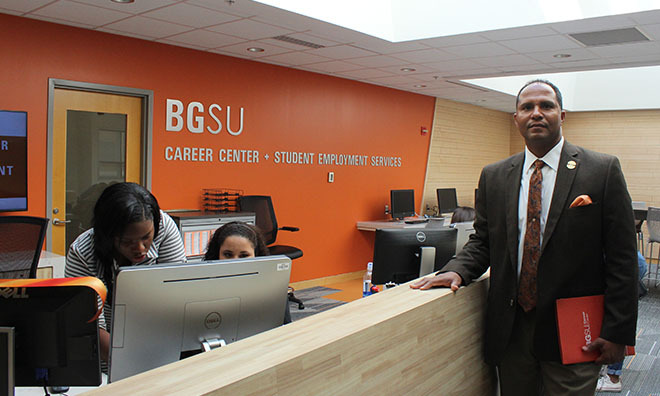 And BGSU has built a network of options that is helping many students see their futures in area business and industry. The idea is to help students become more strategic in their course selections. Jackson said this helps students more efficiently select classes that complete requirements for graduation. All incoming first-year students are eligible to participate in the program, including those who have completed college credits during high school. The program requires that students maintain a 3.0 grade point average, declare a major by the beginning of their sophomore year, and make satisfactory progress toward a degree. There have been encouraging additional benefits to the internship program. “Two-year retention among those participating in the internship program is about 10 percent higher,” Jackson said. Participation among freshman has risen to nearly 20 percent, and the increase is expected to continue as awareness grows and students see how others have benefitted. Student experiences can occur in individual and group internships, thorough co-ops and undergraduate research, and with field experiences. Jackson said the program grew as state grants such as those offered through Ohio Means Internships and Co-ops (OMIC) became available. BGSU currently operates one of the larger OMIC grants, which has created nearly 100 internships through some 40 area employers. Keller Logistics in Defiance, Ohio has been an OMIC II partner since the inception of the grant in 2014. The company has hired a total of 14 interns in the field of sales, customer service, operations, human resources, health and wellness, management, and information technology. This year, the OMIC grant funded 93 internships in area businesses and in research departments at Bowling Green. Keller Logistics participates heavily in Bowling Green State University’s recruitment events, including the annual EXPO Job and Internship Fairs in the fall and spring. More recently, Mariah Short, HR coordinator for Keller Logistics, has increased and diversified recruitment efforts through one-on-one employer consulting appointments, participating in Career Center on the Move (union tabling), and sharing full-time job and internship opportunities during BG’s internship preparation course for computer science students. Jonathan Wolfrum, Keller’s director of operations, is a 2008 BG business school graduate who began as an intern while a student at BGSU. Interested in supply chain logistics, his internship grew into a career with Keller. Wolfrum was raised in Defiance, and seized the opportunity to put down his own roots in the area. He’s since welcomed numerous interns from BGSU. He currently employs several, including Josh Evers, a 22-year-old junior from Huron, Ohio majoring in supply chain logistics. Evers is a National Guard soldier enrolled in BG’s ROTC program. He’s developed a program that is taking a deep dive into trackable metrics to boost the efficiency of the company’s shuttle drivers.